Chiquita Melvin is a graduate student in the M.F.A. Acting Program. Originally from Atlanta, Georgia, Chiquita received her Bachelor of Arts degree in Political Science & Spanish from the University of Georgia. Always possessing a love for the stage, Chiquita decided to pursue a professional acting career moving to Los Angeles, California where she trained and worked on stage (A Gathering of First Ladies), television (I Didn’t Know I Was Pregnant, America’s Court), and in independent films (He Heard My Cry, Mona) among others. Chiquita has been a part of the Atlanta Regional Theatre community as a member of the Horizon Theatre’s Acting Apprenticeship Company. 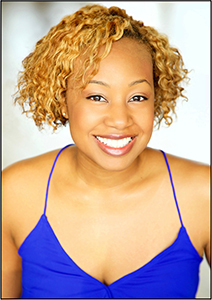 Chiquita has also performed in several plays in Atlanta such as original play 2 Sides, the powerful war drama A Piece of My Heart (Steele) and the Kaiser Permanente Educational Theatre play Fragments: Impressions of Grief.